In order for Integromat to automate your tasks for you, you have to create a scenario. A scenario is comprised of a series of modules that indicate how data should be transferred and transformed between apps/services. To exemplify how to create a scenario, we will go through the 4 step process step-by-step. 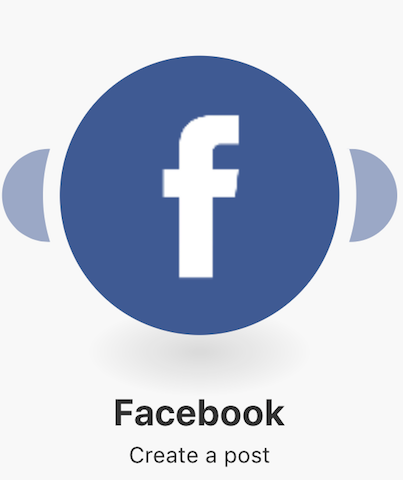 We will use the scenario of sending your new tweets from Twitter to your Facebook wall, as our example. Note: Before you begin creating any scenario, ensure you are signed into your account and on your Dashboard page. 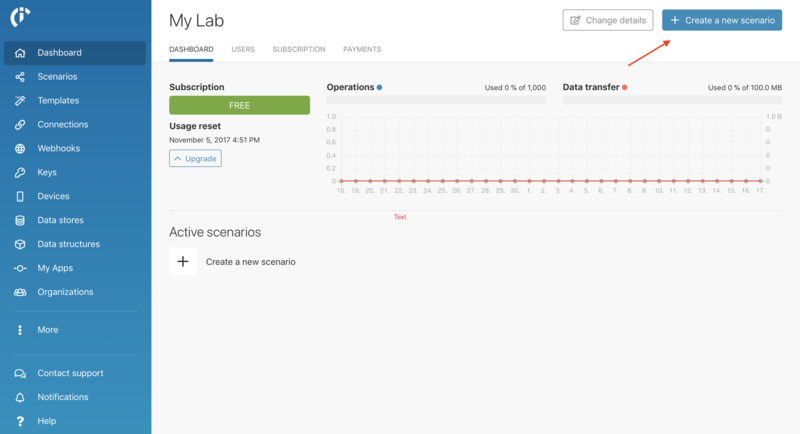 Once in your Dashboard, click the Create a new scenario button, as seen in the top right hand corner in the image below. 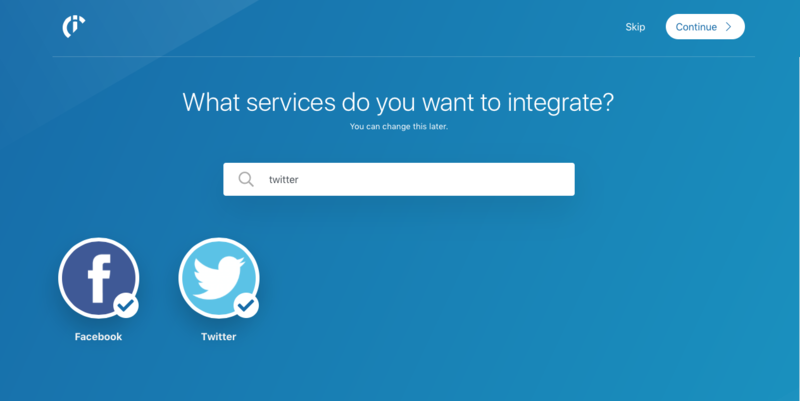 A screen will come up that will allow you to search and choose the apps/services you would like to use. 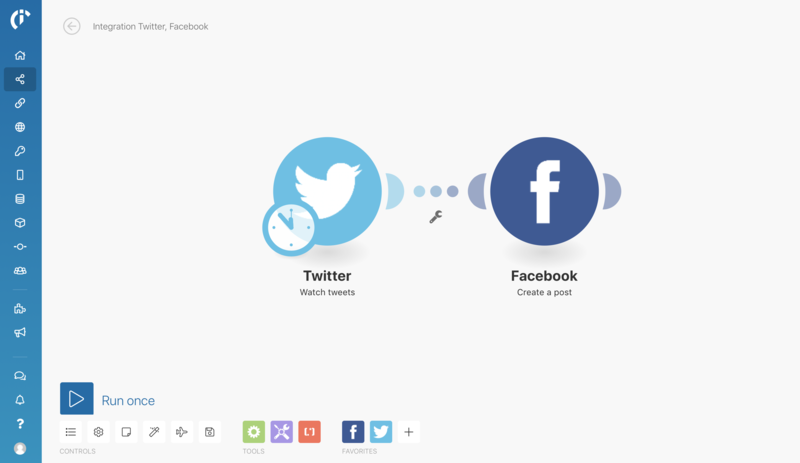 In this case, search for Twitter and Facebook and click continue in the top right hand corner. Now in the scenario editor screen, an empty module with a question mark will be displayed. Here, you will have to choose what data the scenario should watch for. You will do this by choosing a trigger that will start your scenario. 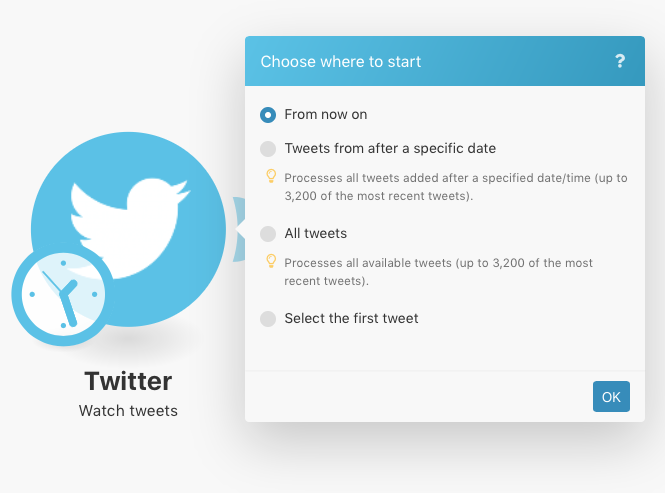 In this case, click Twitter and choose the Watch tweets module. As in all cases, you will now have to make a connection to the corresponding service. 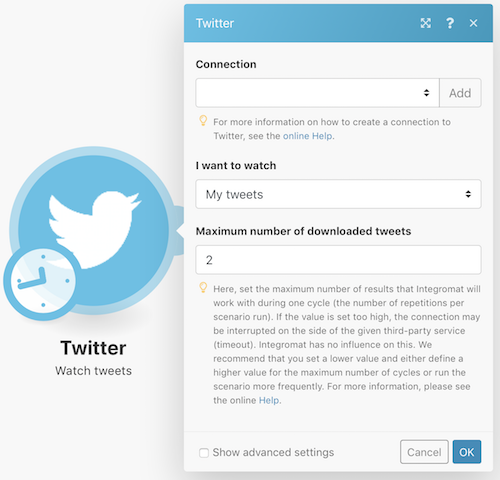 In the image below, you will see the prompt to connect your Twitter account to Integromat. Next, you will have to choose where to start grabbing data from. The below image is a representation of the different options available. Now, click the right ear of the first module and it will pop up a screen for you to add the next module. 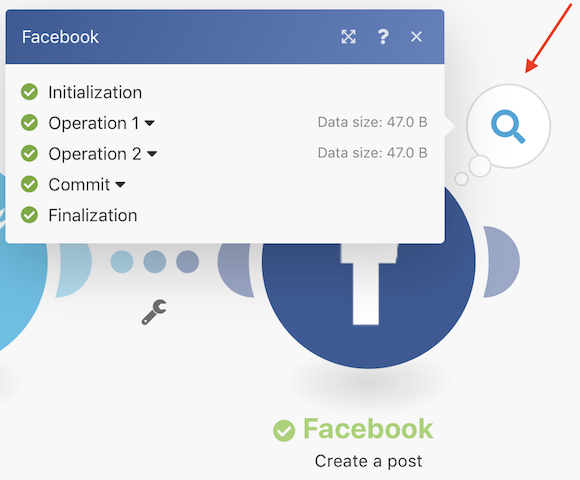 In this case, add the Create a post for Facebook module. Once again, you will have to create a connection to this service. 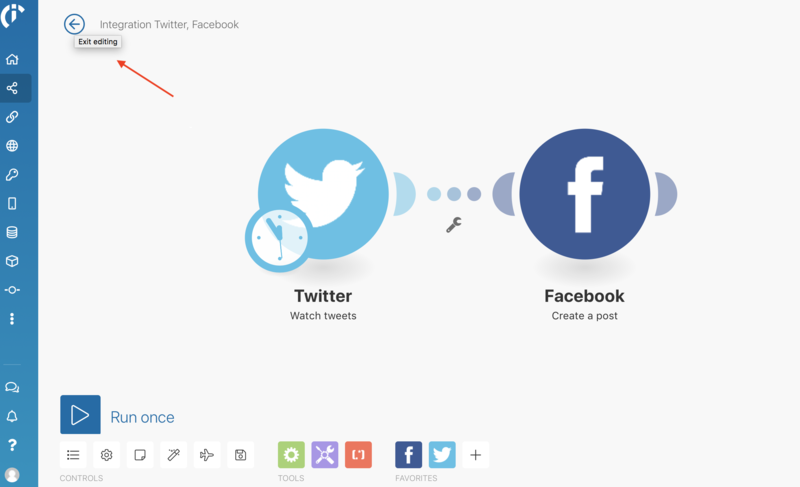 Lastly, you will have to map the items that you want to send from Twitter to Facebook. Note: For more robust scenarios, repeat the same steps for Step 2 until all the modules are added. Before you activate your scenario, you should test your scenario by running it once. 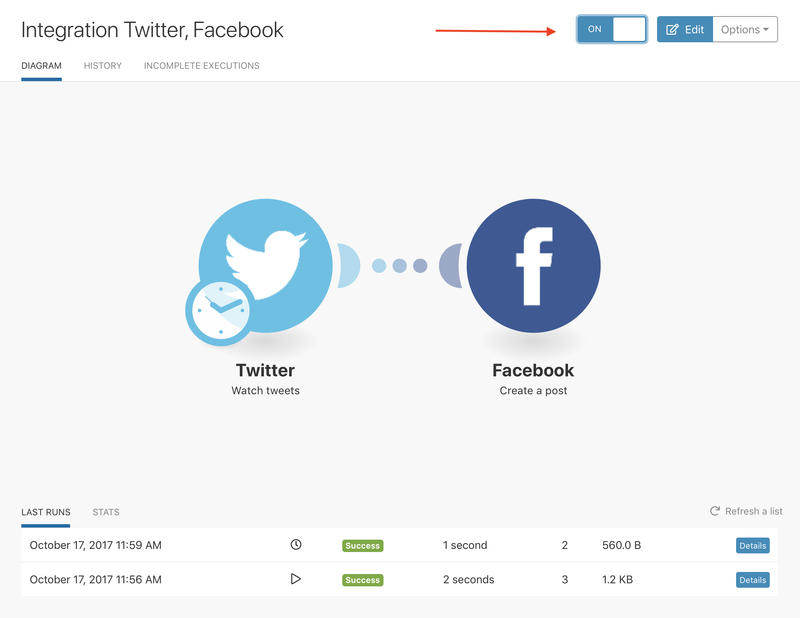 To test your scenario, click the play button with Run once beside it. Once you have tested your scenario, there will be a bubble on top of the preceding modules that will provide information about the processed data or what is refered to as bundles. By clicking this icon it will display the information about the processed bundles, including the number of operations. By clicking the individual operations (Operation 1 and Operation 2 in the diagram below), you can see which module settings were used and which bundles were returned by which module. For more information, please see the Execution flow section. Testing your scenario is vital for seeing how data flows through your scenario. It will also help to show if there are any errors in your scenario. Note: If you encounter an error for any scenario, please see our Error processing section. Your scenario is almost ready to run, but it's still inactive. To activate your scenario, exit the scenario editor by hitting the arrow key in the top left hand corner, as shown with the red arrow in the image below. This will return you to your Scenario page. Here, you can activate your scenario by clicking "ON" on the ON/OFF button that is at the top of your scenario page. Once activated, your scenario will run according to its schedule. For further details on any step or other information regarding scenarios, please visit our complete Scenarios help guide.